At one point in time my car sat for a few years because I didn’t have time to work on it. 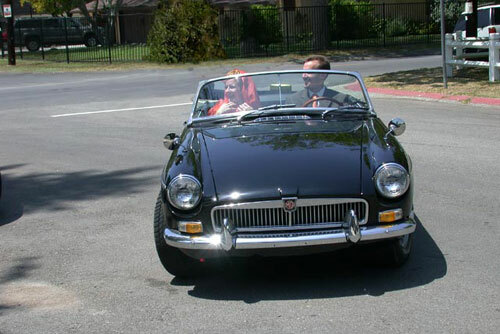 One day my girlfriend and I had a thought… wouldn’t it be fun to drive off from our wedding in that car some day? Years past, we got engaged, and less than two weeks before our wedding I remembered that passing thought. 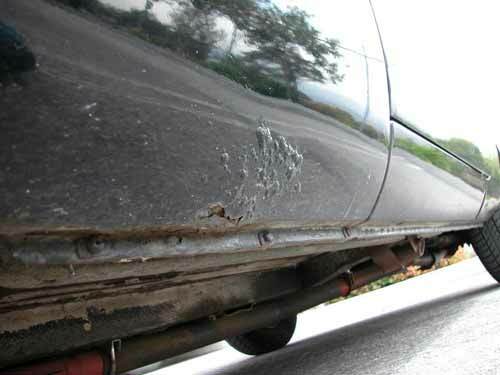 I decided to attempt what seemed impossible – to get the car in wedding shape before the big day! 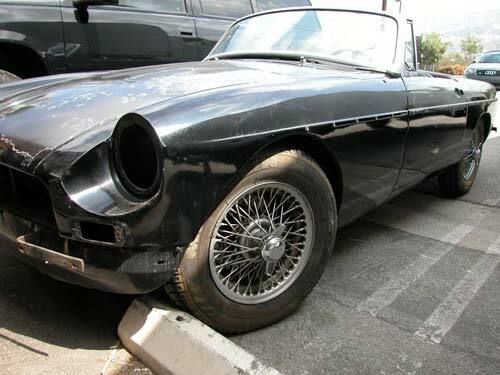 The car still needed to be stripped, bodywork and rust repair done and repainted. There were many mechanical and interior projects to complete as well. 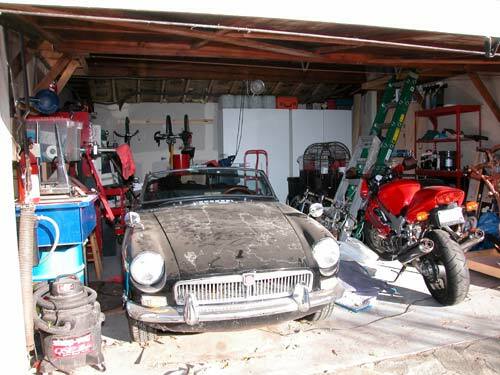 Undaunted, I committed to the task at hand…..
Less than two weeks before the wedding, I opened the garage to get a start on the wedding car project. This is what I saw. It was already difficult to not become discouraged. 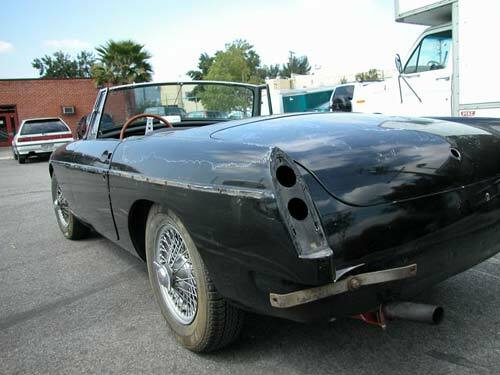 Much of the car would have to be disassembled before metal and paint work could be done. The interior was near completion but filthy. Some wiring was necessary but fortunately the drivetrain was in perfect condition. Disassembly started and went on until I had everything off except the windshield, so I could make an outlaw run to the paint shop. I got a few strange looks as I drove through the neighborhood driving a shell of a car! Eight days until our wedding, and the car was just heading for body and paint. The following photos show what it looked like at this point. 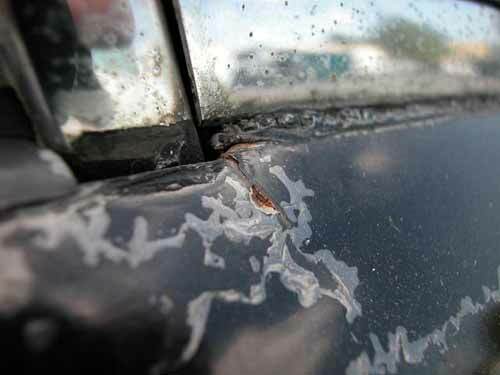 Rust pockets had developed in the usual places for British cars, and a few small stress cracks appeared in the sheet metal. Disassembly went slowly but well and many new trim parts were ordered from Moss Motors. I worked on the car whenever I had the chance to, through day and night. 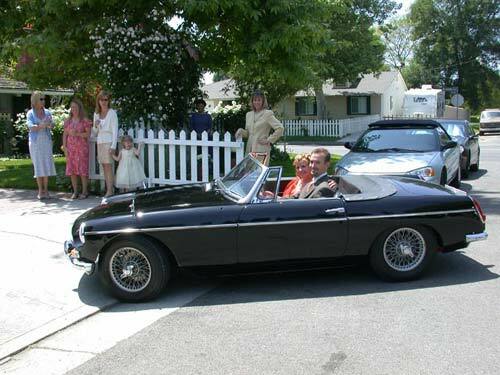 On the morning of our wedding my wife-to-be took my word that I would show up for the ceremony with the car, and left with the house ahead of me to prepare. With just two hours left before the ceremony I had a wrench in my hand, still installing exterior parts. There was no time to make things perfect – it just had to run and keep all its parts attached. 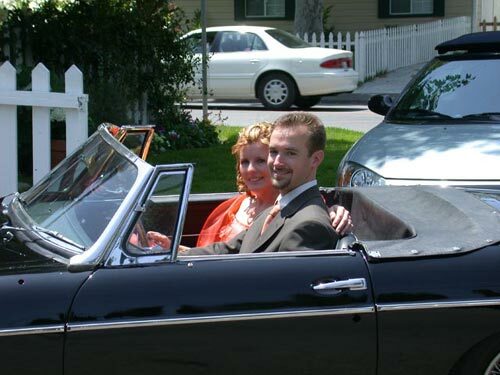 I made it, and we drove away from our wedding in the car as we had hoped to years earlier. 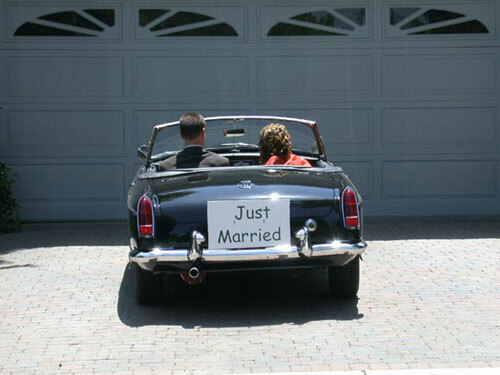 I did feel a bit funny however when I had to drive the car to the ceremony by myself… with a huge “Just Married” sign on the back! You may spot a few things not quite right on the car, one of them quite major and kept a secret from my passenger, but all the bits were still in place when we got home. I soon corrected them, but that was not truly the end of the project. It continues to this day with no end ever planned, nor will there be an end to the smile it puts on my face!